1109. 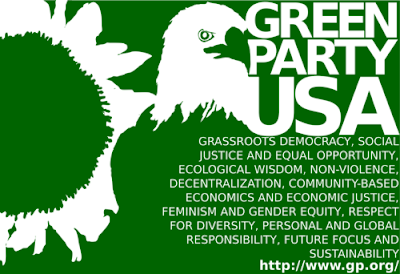 A Deep Green Alternative: A Document of the Green Party U.S.A.
People are losing their jobs and homes. Many throughout the world are without food, medical care and transportation. Instead of addressing real needs, governments and international financial institutions are designing “austerity programs” that cut back on basic services and privatise everything from education and mail delivery to pension plans and public health. Wouldn't it make more sense to reduce working hours and ensure that everyone has enough work while no one is overworked? A Deep Green Alternative means producing those things that are necessary while stopping the manufacture of goods that are unnecessary. This could provide meaningful lives for all of us while preserving the world from further destruction. 1. Social justice activists often advocate massive increases in production (i.e., “economic stimulus”), which are at the root of ecological crises. Producing more today will make life unbearable in the future. 2. Those who seriously address ecological crises understand the need to end practices such as logging, fracking, tar sands extraction, removal of coal from mountain tops and long-line fishing. But is it possible to massively reduce fuel production while maintaining employment? 3. Some react to this contradiction with a Green New Deal, which would use environmentally “friendly” technology for an enormous stimulus package. But this could not provide work for everyone and it would worsen environmental problems. A shorter work week is the beginning point for addressing problems that concern us all. It would allow us to move rapidly toward full employment at the same time we put the brakes on extractive industries. But working less than 40 hours a week is distressing if it means losing health insurance, losing pension plans and failing to make home payments. Labour concerns are thus an essential part of environmental protection. We need to replace the health insurance industry with universal free medical care. We must double or triple social security in order to replace private pension plans that are inequitable, inadequate and disappearing. There needs to be a moratorium on (or an end to) home foreclosures and protection for anyone caught in the housing bubble. When these basic needs are guaranteed as human rights, millions of people would be happy to work only 30 (or 20) hours per week. This would help strengthen families and would lay the groundwork for reducing the manufacture of harmful and destructive products. The simple facts are these: (a) it is not possible to reduce greenhouse gases (GHGs) without drastically reducing the burning of fossil fuels; and (b) the economy will shrink as we use fewer fossil fuels. The same holds for biodiversity, industrial poisons and preserving “natural resources” for future generations. A huge reduction in industrial activity is necessary to protect human health and the environment. Does that mean we need to give up rebuilding inner cities and endure lives of sacrifice and suffering? Definitely not. Such an enormous amount of the economy goes to wasteful and destructive production that we can provide basic necessities at the same time as we cut back on burning fossil fuel. The following are several examples of a deep green approach. Wars of the 21st century are being fought to ensure that major global powers have access to fossil fuel from around the world. US citizens do not become safer as the military kills people so that corporations gain control over their natural resources. The quality of our lives is not improved by having hundreds of military bases across the world. By reducing the US military to 1%–2% of its current size and eliminating the stockpile of nuclear weapons we would be more secure and save trillions of dollars. Mass incarceration functions as a comprehensive and well disguised system of social control, analogous to Jim Crow. The drug war drives mass incarceration, accounting for over half of the five-fold increase in the prison population since the 1980s, with more than 80% of drug crimes being for simple possession. Although drug usage is known to be approximately equal across races, blacks account for the vast majority of drug convictions, up to 90% in some states. As convicted felons, blacks are denied the vote (one in seven), face legal employer discrimination in hiring, cannot get professional licences, are denied public housing and welfare benefits and typically have wages garnisheed to pay court costs. This disgraceful racial caste system is intolerable in a green society: it can be ended by replacing the drug war with a system of legalised regulation. The most important source of GHGs from the food industry is the overproduction of meat. By ending “factory farming” of animals and having meat-free days, we would also reduce many types of heart disease. Industrial agriculture is primarily devoted to processing, packaging, advertising, transporting, genetically modifying organisms and overusing petroleum products for pesticides, fertilisers and machinery. These expenses are often subsidised by tax dollars. A deep green approach would replace subsidies with taxes on industrial food and provide subsidies for organic and plant-based production of food. This would increase the quantity of nutritious food and reverse the decline of the family farm at the same time as it shrinks agribusiness. We need to immediately begin the transformation of urban USA into walkable neighbourhoods. There should be neighbourhood stores (such as grocery, barber shop, pharmacy, hardware) so that non-handicapped people can make 80% of their trips by bicycle or foot and use mass transportation or car sharing for the rest. In contrast, green capitalism promotes “energy efficient” cars as a way to reduce GHGs. Yet, every improvement in energy efficiency is more than offset by an increase in the number of cars on the road. In order to eliminate vehicle trips with few passengers, we need to phase out the individually owned car. Within a few years, the only vehicles needed for urban areas would be those for emergency (ambulance, fire, police), industrial/construction transport, mass transit, handicap and car sharing. The vast majority of the US private medical industry goes to making money for itself instead of keeping people well. These funds are wasted in the insurance industry, providing unnecessary or harmful treatment, inventing diseases, exaggerating diseases that exist, turning minor illnesses into major ones by denying care to the poor, and focusing on hospital care that exposes people to new infectious agents. A deep green medical alternative would provide universal free community and preventive medicine. Clinics and doctors’ offices in urban areas should be located so that patients can walk or bicycle to them or doctors can walk or bicycle to their patients’ homes. (Contact the Green Party USA to find out where this has already been done for years.) This would improve the quality of our lives at the same time it reduces medical costs enormously. Have you ever had something fall apart just after you bought it? Are corporations doing this intentionally to force us to buy more and more? “Planned obsolescence” of consumer goods (a) forces society as a whole to spend more hours at work manufacturing things that are designed to self-destruct or go out of style, (b) exhausts more natural resources and (c) introduces more GHGs and industrial toxins into the environment. A Deep Green Alternative would require that all products be manufactured to last as long as is technologically possible and that worn-out and broken products be returned to the manufacturer who would be responsible for reusing 100% of the component parts. It is simple arithmetic: if we designed products to last 10 times as long, we could reduce production by 80% while having twice as many consumer goods. Survival of humanity requires a profound change in moral values: we need to challenge endless economic growth. Where will new moral values be most likely to develop? In the minds of isolated individuals? In our role as consumers? Or in our working lives? How can society make the profound changes that are necessary for survival? Too often, the answer is: “Purchase the right products.” But the right consumer choices are often unavailable, impractical or make little to no difference. Our power as producers vastly exceeds our power as consumers. Right now, our civil rights end when we begin our work day and only start up again when work is over. This needs to end. The most important voting right we should have is the right to vote on what to produce and how to produce it. The Deep Green Alternative requires a “Deep Green Producers’ Discussion”. Every group of working people needs to ask if what they are producing is good or harmful. Should it be increased, changed, reduced or abolished? If they decide that what they produce needs to be reduced or halted, how should the changes be made and what alternative jobs should they have? This is the type of question that all of us need to ask if we are going to begin the process of building a new society and a livable world. The concept of changing consciousness is empty if we are forced to participate in harmful production with no power to curb it. Being able to have a serious producers’ discussion assumes that we are building a society in which all people are guaranteed the right to change to a different job if they decide that what they are currently doing is destructive. Clearly, we need to stop manufacturing products that are unnecessary. But who decides what is and is not necessary? For too long, that decision has been made by the 1%. They define “necessary” as anything that can get them more profit, regardless of what it does to workers, communities and nature. The 1% have shown that they cannot make morally responsible decisions about the economy. Now is the time for the 99% to take over 99% of that decision-making power. A shorter work week must be accompanied by an increase in income equality. It is needed to guarantee workers a living wage and to fund social security and health insurance. Over the past 30 years income inequality has dramatically increased. During this period worker productivity has risen by 84% while real compensation has increased by just 10%. Extreme income inequality is associated with adverse social and health outcomes: it is inconsistent with a viable democracy. The Green Revolution heralded itself as a fabulous new way to feed the world with seeds of crops well-adapted to industrial-style agriculture. But those crop varieties made farmers dependent on seed companies and required huge use of fertilisers and pesticides. Relying on a few crop varieties resulted in monocultures and loss of agricultural biodiversity. The Green Revolution was associated with increased soil erosion, massive irrigation, dams and disruption of water ecology. The uniform crops allowed for machine harvesting, which further increased oil use as it took jobs from agricultural workers. Green capitalism is pushed by industry to add environmental markets to already existing markets. Every other product advertised on TV claims to be “green”, even when it causes huge environmental damage. For example, manufacturers push “green cars” as more fuel efficient. Green cars make driving cheaper, help perpetuate the individually owned car as the main mode of transportation, and undermine walking, cycling and mass transit. The Green Economy claims to “protect the environment” by privatising it. Its advocates want to protect rivers, streams, oceans, polar ice caps, forests and even air that we breathe, by auctioning them to the highest bidder. The Green Economy is designed to enable the ongoing release of carbon emissions and the continuing destruction of biodiversity and ecosystems by allowing corporations to purchase carbon offsets or biodiversity offsets from poor countries to supposedly counteract their pollution or environmental destruction. One example of this is REDD (Reducing Emissions from Deforestation and Forest Degradation). REDD includes paying poor countries to “protect” their forests and the carbon they store in order to allow companies in the global North to continue polluting. It funnels money to corrupt politicians and drives Indigenous peoples out of forest homes in order to “protect” them. Once this is done, forests are then susceptible to illegal logging. The Green New Deal (GND) is the latest in this series of imitation “environmentalism”. It promises to “get America working” by providing millions of green jobs to repair decaying infrastructure, rebuild inner cities and extend social services. These are projects that all of us should support. But the GND cannot accomplish its goals. It cannot, by itself, create jobs for everyone because it ignores the need for a (much) shorter work week. Franklin D. Roosevelt’s New Deal never did more than reduce unemployment, and it did not do that consistently. The GND cannot protect the environment because it is based on protecting corporate power just like the Green Revolution, green capitalism and Green Economy. It relies on two clearly false corporate myths: that infinite growth is possible on a finite planet, and that growth is necessary for everyone to have good lives. The GND ignores the impossibility of endless growth and the horrible consequences of trying to achieve it. At a 2% growth rate, the economy would double at least every 36 years. At a 3% growth rate, a doubling would occur at least every 24 years. In a hundred years, production would be 16 times what it is now. In 200 years the economy would be 256 times what it is now. This would flood the world with toxins, collapse biodiversity, and cause uncontrolled climate change. Suggesting that solar and wind power can meet not only all household energy needs but 100% of current industrial needs is a fantasy. Suggesting they could do so for an economy that is 256 times as large is silly. The GND never asks the most important question of our time: If we can produce all the things people need by working 20 hours per week, why would we want to keep a 40-hour work week? to have the document in pamphlet version.